Home / Blog/ Which is the Best Bleach For Me? Which is the Best Bleach For Me? "I am Trying to Get My Hair Like the Picture Below. Which is the Best Bleach For Me?" 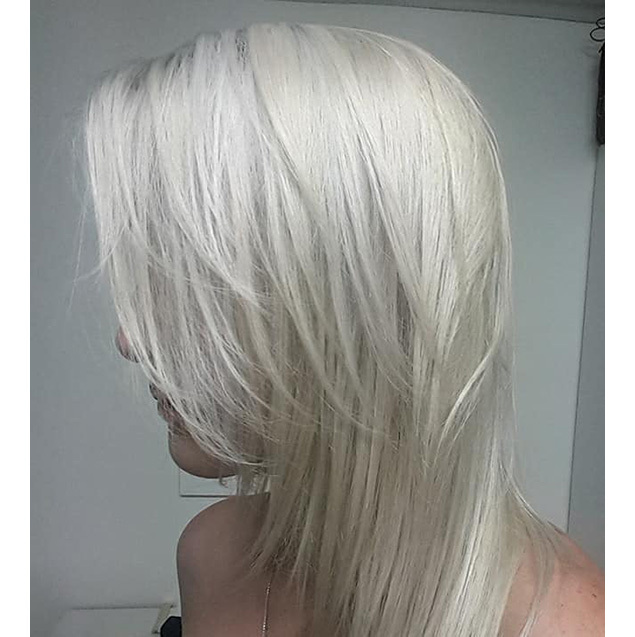 Model: Mag Sam after using 3 products: Brilliant Blonde Bleach, Intense Pearl Blonde Toner & Purple Shampoo. Which Bleach Should I Use? If you need to lift hair by 3 or more levels, it is important that you use a bleach which is fast acting but at the same time controllable and safe. 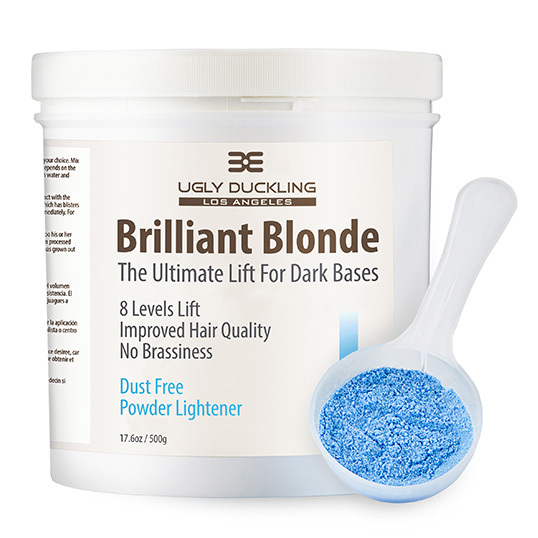 Brilliant Blonde has been formulated for dark bases. It can lifts up to 8 levels, from brown to the palest level 10. It is blue and dust-free. It mixes with 20 or 30 Vol developer into a creamy mix which is easy to apply quickly, so you can work quickly. Which developer Should I Use With This Bleach? Check what your hair current color level is and what your desired hair color level is using this reckoner below. Subtract one from the other and you now know how many levels your need to lift. The rule is if you are looking to lighten 1-2 levels, you can use 20 Vol Developer. If you are looking to lighten 3 levels and more, use 30 Vol Developer. If you are applying near the root area, use 20 Vol Developer. So, if for example, you are a 5 Light Brown and you are looking to get your hair like the picture above (level 10), that would be a 5 level lift. If you are looking for a true ash blonde, you must try and take the hair up to level 9 or 10. You would need to use 30 Vol Developer for most of your hair. But you would still need to make a separate mix of 20 Vol for the root area. What Mix Should I Use For This Bleach? Brilliant Blonde works best when the mixture is fairly runny. That is why we recommend a 1 part bleach to 2 part developer mix. This will give you a nice runny "wet" mix which is easy to apply and which will allow you to work fast. Also, when the bleach mixture dries out it stops working. This is why a relatively "wet" mixture is recommended. Mix together in a non-metallic bowl using a plastic whisk until you have a nice creamy consistency. Now you are ready to apply. How Should I Apply This Bleach? Make fine sections, starting from the back, where the hair is the thickest. Take very thin sections and saturate heavily. Work your way around to the sides and the top until you have covered the whole head. Always avoid the last inch near the scalp. This part always lifts the quickest because of the heat of the scalp and because it is generally virgin hair. You can return to this part toward the end. Work fast. If you are working on very long hair, as you progress around, you will find that the last sections have had much less processing time than the first sections on which you applied. To some extent, the fact that you started at the back where hair is the thickest and slowest to lift will compensate. But if not, you may need to wash off the first sections first and let the later sections keep processing. Don't hesitate to make a fresh mix and re-apply on parts where the mixture looks like it is not lifting properly or is drying out. If you have different colored lengths with for example some parts orange, other parts dark black box-dyed, the darker parts will need more lightener applications and greater processing time. Once the hair looks like it is three quarters lifted, make a fresh mix, this time with 20 Vol (only use 20 Vol near the root area). Apply there and watch and wait. How Long Should I Process the Bleach? In general, bleach does not have a fixed processing time and you need to be prepared to wash off as soon as you have got everything to a consistent level 10. The most common mistake stylists make is to rinse off too soon. If you are aiming for a really blonde look, you must lift until you get to level 10. Trust us, Brilliant Blonde will get your hair there provided you let it. What About Toners? Aren't I Supposed to Apply A Toner? Yes you do need to apply a toner after bleaching. If this is a first time bleaching you will almost certainly still have a lot of yellow in your hair. We would suggest either Intense Pearl Blonde Toner or Intense Silver Blonde Toner. Make a mix with 20 Vol of 1 part toner to 2 parts developer. Apply quickly, once again saturating the hair very intensively and applying first on the lengths and returning to the roots only at the end. Processing time for the toners is around 10-15 minutes. 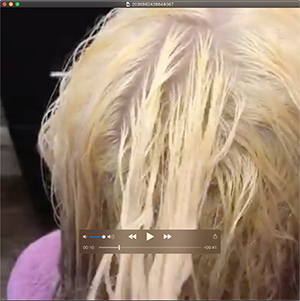 At the end of this time, you will see the hair shedding the last yellow and absorbing the grey and purple pigments from the toner. How Do I Finish Up After Toning? To get your hair to a perfect ash blonde, follow up the toner with Purple Shampoo and Mask as we did with our model above. Rub and massage intensively to allow the pigment transfer. For the purple mask, you can let the product sit on the hair for 10 minutes using a plastic cap and some gentle heat. Then rinse and blow dry. I'm trying to get my hair a platinum blonde but it has come out yellow blonde. What should I do? It sounds like you have not lifted quite enough, and you need a good quality toner. Check your hair, making sure it is still strong and has good elasticity. If is is in good condition, do one more lift using Brilliant Blonde and 20 Vol. Get it up to a true level 10. At this stage it will still have some yellow in it. This is normal. But then you now need to apply the Intense Pearl Blonde or Intense SIlver Blonde Toner. These toners contain booster for getting rid of the last yellow and their pigments will also neutralize the brassy pigments effectively. Then purple shampoo and mask as above. The bleach brought my level 3-4 pre-colored hair to a level 9 with two processes and little damage. If I were to ever open my own salon, I would definitely consider using the entire UD line in my salon. There is simply nothing better. - Facebook Review.